The Flealess Market is expanding through the efforts of volunteers, businesses and animal welfare non-profit organizations across the U.S. Add Your Voice! Are your local animal shelters, wildlife rescue groups, habitat preservation and SPCA non-profits represented on the World Wide Web? If not, Flealess Market sponsors will create, maintain, and host their websites at no charge - ever! 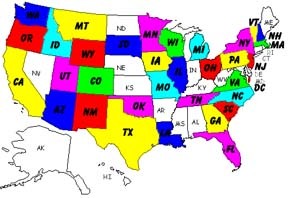 The highlighted states on the map have volunteer, business and/or non-profit organization participants. With the addition of Lost Pets International, we hope to add a world map of participants in the near future.